The answer is: it's complicated. A common situation people face is deciding between paying off debt or investing. Both are admirable and necessary. Paying off your debt means reduced stress, lower risks, and a greater ability to withstand personal emergencies. Living debt-free will also make it easier endure an economic recession or depression, and you'll have increased flexibility that can maximize personal happiness. Investing means building a reserve that can protect you and your family and provide you with sources of passive income. Perhaps most importantly, it means accumulating enough money to retire comfortably. The rate of after-tax interest you are paying on your debt. The after-tax rate of return you expect to earn on your investment. In other words, if you can earn a higher return on your investments than the interest on your debt, you should invest. Otherwise, you should pay off your balance. An illustration would be billionaire investor Warren Buffett purposely carrying a mortgage on his home in Omaha, Nebraska up until recent decades because he knew he could put the money to work elsewhere in his investment portfolio and make a lot more in the long run. However, this is not always optimal once you've considered risk-adjustment. Instead, many financial planners these days recommend what I consider to be a more intelligent set of guidelines that provide the best of both worlds. Fund any retirement account you and your spouse have at work, such as 401(k) plan, up to the amount of any free matching money you receive. For many companies, matching amounts range between 50% and 150% of the first [x]%. Build your emergency fund in a highly liquid, checking, saving, or money market account. At least three months of expenses is a good guideline, but it's OK to save even more. If you meet the eligibility guidelines, fully fund a Roth IRA for both you and, if you're married, your spouse. You'd need to check the contribution limits in effect in any given tax year. For example, in 2019, a married couple earning less than $135,000 in adjusted gross income can contribute up to $6,000 of earned income per spouse ($7,000 per spouse if 50+ years old). Pay off any high-interest credit card debt, student loan debt, or other liabilities. Personally, I'd probably prioritize student loan debt because it can be the most difficult to discharge in bankruptcy. Keep at it until you are debt-free and stop adding to it at nearly all costs. Circle back around and contribute to your and your spouse's 401(k) accounts up to the maximum amount permitted by your plan or the tax regulations. 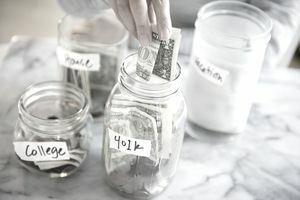 If you're serious about retirement saving, look into a strategy that involves using HSA (Health Savings Accounts) as another type of de facto IRA on top of your Roth IRA. Begin building assets in fully taxable brokerage accounts, dividend reinvestment plans, directly held mutual fund accounts, or even buying other cash-generating assets. For example, a real estate investor could purchase apartment buildings, office buildings, industrial warehouses. You might also consider funding a college 529 savings plan for your children and/or grandchildren. You minimize your tax bill, which means more money in your own pocket. You reduce your debts over time. There comes a point at which they're entirely repaid, and your free cash flow goes through the roof. You only make riskier investments in taxable accounts once all of your other basic needs are met. For example, if you have a lot of debt and a small retirement account, you probably shouldn't be investing in IPOs. Alternatively, it's not a terrible idea to be completely debt-free, drawing a line around your assets so you never have to worry about having them taken from you. I know of people who eschewed any investing at all until they owned their own home outright, paid off college, and had built an emergency fund working ordinary jobs throughout their twenties and early thirties. By the time they were approaching middle age, they had a foundation that allowed their investable assets to soar, totally unrestrained by the financial demands that seem to haunt certain individuals and families in perpetuity. In other words, their answer was always to pay off debts first, then—and only then—begin investing. And for many people, this works out very well in the long run. In the final analysis, my opinion is that behavioral economics needs to be factored into your decision. You have to decide between investing and paying off debt that 1. you can live with, 2. you're likely to stick with until it's completed, and 3. lets you sleep well at night. As long as you keep going, you should eventually get to the end-game objective, which is to have no debt and an abundance of great, lucrative investments providing a comfortable standard of living for your family. With enough patience and hard work, this is a goal that you can achieve.